It’s been more than a year since the announcement that anime director Makoto Shinkai’s "your name." is being remade as a Hollywood live-action movie, with JJ Abrams serving as producer and Eric Heisserer as screenwriter. Since then, however, there’s been no concrete news on the project’s status, which might have left some people wondering if it had died on the vine like so many would-be Western adaptations of anime that have come before. But in a recent interview with website /Film’s Fred Topet, Heisserer reaffirmed that the Hollywood "your name." is still very much on, and even boldly asserted that Americanization of the story is something that’s going to happen in the transition. While there are always changes to be made when adapting a work of fiction from one format or primary target market to another, the anime-to-Western-live-action route has historically proven to be an extremely difficult one. Topet acknowledges this by questioning Heisserer whether or not the "your name." Japanese rights holders are feeling any unease radiating from the poor reception the live-action Hollywood version of "Ghost in the Shell" got from critics and audiences. 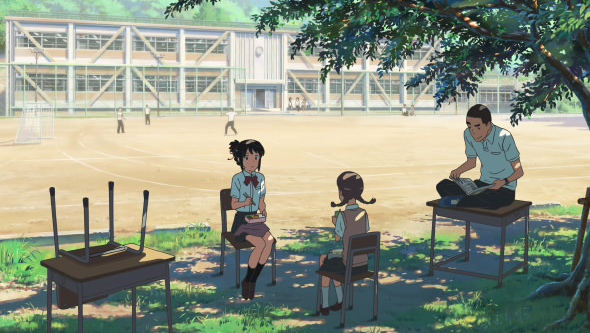 Heisserer doesn’t go into any specifics about what distinguishes his planned adaptation for "your name." from the course taken by the live-action "Ghost in the Shell," but his claim that his vision was selected over dozens of alternatives is heartening, as is his straightforward declaration elsewhere in the interview of “I love that movie” in referring to the "your name." anime, since hiring a screenwriter without any affection for the source material is a surefire way for an adaptation to completely miss what made the original resonate with audiences. The accepting attitude from the Japanese side towards Americanizing the story also meshes with Shinkai’s own stance, as he himself has said he’s “not really that interested” in the Hollywood "your name." and has already moved on to his next theatrical anime project, "Tenki no Ko" (Weathering with You). And considering how steeped in Shinkai’s personal style and emotional cues the "your name." anime is, without his involvement the live-action version desperately needs to find a voice and tone. That’s something that most likely necessitates changes to the original, and if the live-action "your name." has an American screenwriter, a decision to make it feel more American isn’t surprising. Do not make a Hollywood adaption of any Japanese anime, period. The list of box office flops, Attack on Titan, Ghost in the Shell, Dragon Ball Z, et al, speaks for itself. I can just picture an American live-action version. Male lead "Hey, where's the Mcdonald's...dude, I wanna be a chick. Sounds awesome! " Female lead " Oh, I so wanna be a guy!" Ah yes, Hollywood at it again with the cash grabs. Absolute garbage. I hope this flops. Not much into anime. I know, I know, I should be ashamed. But I do enjoy Japanese horror movies. It wasn't a bad film, but a significant part of it involved the boy groping himself when in the girl's body, plus the up skirt shots of her underwear. Just not in line with western (USA's) sensibilities. a significant part of it involved the boy groping himself when in the girl's body, plus the up skirt shots of her underwear. I would hardly say it was 'a significant part'. Happened once at the start, then they showed it in flashes a couple of times. Americanized versions of anime will always fail because American producers and script writers do not understand subtly. Same can be said for the American audience. The Japanese however are masters at subtly and thats what makes anime so seductive and why I love it. I never watch or support any western interpretation of anime, it's a waste of my time. And I also wonder, is it worth the cost, the price , to the creators of anime, to have your work trashed? Muireall, Americans may not understand subtly, but many of them understand subtlety. You just need a dubbed version. Americanized version will just be horrible just like most of the other americanized versions. Don't wash "your name" down the drain for money. Anyone remember how long it took for the American version of the Japanese live-action movie "Shall We Dance?" Or the Japanese novel "All You Need Is Kill" / "Edge of Tomorrow"
There's already a dubbed version even shown in theaters. I don't think the Western remake of "Your name" would sell. Americans don't have the innate "I wish I was a girl" feeling that many Japanese men have. Thus Americans can't emphasize with the premise of "Your name". Remake Godzilla, Evangelion and Gundam, but not Your name. BirdBox is such a horrible mess of a same old type of apocalyptic crap that even all star cast cant save it... horrid shite.... in fact most of what J J Abrahams and Heisserer involved in is just bad cinema..